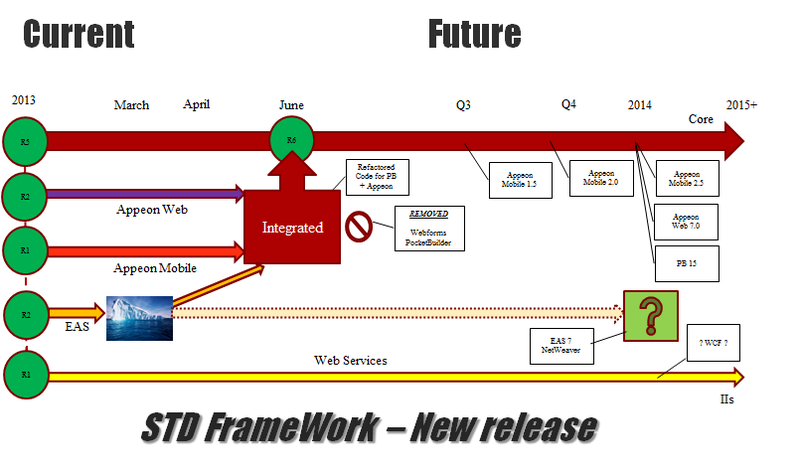 Great White North Technical Evangelist: New Release (2015.1.0.30) of the STD "Integrated" FrameWork! New Release (2015.1.0.30) of the STD "Integrated" FrameWork! New Integrated Foundation Classes Released! The FC's are *free* and can be downloaded (along with an updated sample Order Entry application) from the SourceForge website! Software Tool & Die Inc (STD) is very pleased to announce that they have just released an updated version (2015.1.0.30) of their Integrated Foundation Class library for PowerBuilder "Classic", Appeon Web and Appeon Mobile! The latest version contains the following updates and has been tested with Appeon 2013R2 and Appeon 2015 (GA) using the official MR (maintenance releases) of PowerBuilder "Classic" versions 12.1, 12.5.1 and 12.6. Testing inside of PB included Win32 (both p-code & m-code) deployments while testing inside of Appeon included latest Web Browsers, latest Apple Tablet/Smart Phone and Android Tablet/Smart Phone deployments. Fixed an issue with the "wn_validate_master" window to not error on close. Added PageUp and PageDown keyboard control on the RTE Control base ancestor. Created new "fn_xml_symbolic_replace" function to replace ANSI values with their XML escape codes. Created new "fn_xml_ansi_replace" function to replace XML escape codes with their ANSI character. Added support in "nc_app_controller_master" to handle Log Wrapping. Changed the nc_app_controller_master "of_write_file" function from Public to Private. Revised the "vc_tp_about_web" object code to make the control visible if in a Web application. Added support in "nc_app_controller_master" to get the application's IP address if running natively. Added support in "nc_app_controller_master" to check if ActiveDirectory processing is "required". Revised the "wn_log_viewer_master" DC object code to Return "2" to suppress error messages on Import()! Added new "nc_system_tray_master" class to allows PB applications to reside in the MS-Windows "System Tray". Renamed class "ns_dda_master" to "ns_sqlda_master" for naming standards. Renamed class "ns_dsa_master" to "ns_sqlsa_master" for naming standards. Renamed class "ns_transaction_master" to "ns_sqlca_master" for naming standards. Renamed class "ns_transaction_ase_master" to "ns_sqlca_ase_master" for naming standards. Renamed class "ns_transaction_db2_master" to "ns_sqlca_db2_master" for naming standards. Renamed class "ns_transaction_informix_master" to "ns_sqlca_informix_master" for naming standards. Renamed class "ns_transaction_oracle_master" to "ns_sqlca_oracle_master" for naming standards. Renamed class "ns_transaction_sa_master" to "ns_sqlca_sa_master" for naming standards. Renamed class "ns_transaction_sqlite_master" to "ns_sqlca_sqlite_master" for naming standards. Renamed class "ns_transaction_ss_master" to "ns_sqlca_ss_master" for naming standards. Added a new PBL () to house deprecated objects for each release of the Foundation Classes => Located in the "Deprecated" folder of the framework. Renamed class "nc_active_directory" to "nc_active_directory_master" for naming standards. Revised "nc_app_controller_master" class "of_display_help" method to use iNET object for help file resolution in Web/Mobile. Look forward to trying it all out! Hi Brett ... let me know if you have any questions! That's superb, Chris! Thanks for helping everyone with your integrated framework!